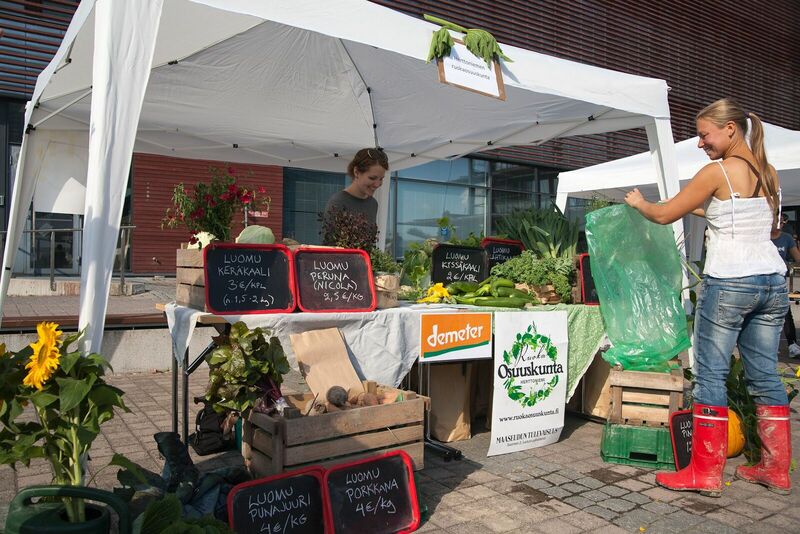 Food producers and consumers meet in the Foodycle festival’s Farmer’s market in Lapinlahti hospital yard. The farmers are selling eg. vegetables, bread and sausage from close by farms of Helsinki. There are food trucks, -bicycles and insect buffet in the market. In addition, a workshops like sausage making or circulating nutritions back to the field (urine and composting toilet) offer hands-on practical experiments for the visitors. At least as important as good food is also spontaneous conversations and meeting people that has been praised by the Farmers’ market sellers and visitors the previous years. In the Foodycle Farmers’ market one can ask how a carrot grows or how is the farmer. We believe this enhances empathy and sense of community in our food production system. Urban food festival Foodycle is organised for the fourth time. This time, we explore what is emphatic eating. Contemporary food production and consumption spoil and burden the ecosystems. In addition, the decrease of natural resources like water, oil and minerals for fertilisers challenges the food production. At the same time, the food production system is considered socially and ethically unjust; the natural resources, food, money and well-being is divided unevenly in between people. Could empathy, identifying with another's situation solve the ecological, ethical and social problems of our food system? Ruoan tulevaisuus ry is an organisation that strives to bring visibility for food system related scientific knowledge and raise discussion in between different partners about ecologically sustain and fair food system. The organisation welcomes interdisciplinary science and other actors. The activities include cooking nights, discussion events and study circles. Read lots more about Foodycle program from here!